The CubeSat standard has enabled low-cost science missions in near-Earth orbit and potentially beyond. Designing a mission within the constraints of the CubeSat size, weight, and power (SWaP) limitations is a challenge. 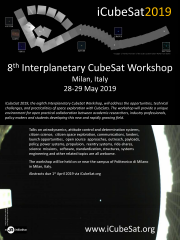 Aurora has developed the MotherCube distributed architecture to enable clusters of CubeSats to perform the tasks of larger, more costly monolithic satellite. Enabling cluster missions are centimeter-precision differential GPS measurements, a CubeSat-scale 100 uN efficient propulsion system, and computationally efficient trajectory planning and cluster control algorithms capable of running on the PIC 24 processor. Cluster control algorithms are under development to achieve the requirements of the mission while meeting the specific design constraints of a CubeSat. Some challenges that must be addressed include (1) the difficulties that arise from the scenario where thrust can only be provided in one direction along the body frame (common in larger satellites as well), and (2) limitations due to attitude control being performed using authority-limited magnetic toque coils. Simulation is showing positive control of attitude and cluster geometry with propellant usage minimized at separation distances of 10 km. The MotherCube satellite itself is biased toward performing the functions of a central node in a cluster including downlink, processing, and storage. Shifting these functions to the MotherCube frees up SWaP on the “DaughterCubes” for payload sensors. Continued work on a scalable, high-thrust CubeSat propulsion system will allow distributed clusters to leave Earth orbit perform interplanetary missions.